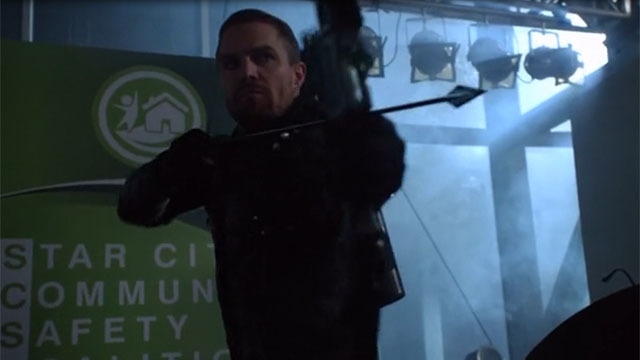 Someone is gunning for vigilantes on Arrow. In last week’s episode, Laurel received threatening letters that managed to unnerve her. And just when Laurel thought the problem was dealt with, Dinah found a threat that was left in her own car. Arrow season 7 episode 12 dealt with their stalker…or did it? Star City’s newest villain wanted his own mask collection, but no one even mentioned the letters. And by the end of the hour, the future of Star City became clear. This was Arrow’s 150th episode, and a few of the departed characters made unexpected returns as part of a documentary. Kelsey Grammer’s dulcet voice narrated The Hood and the Rise of Vigilantism. The film featured interviews with Detective Lance, Sara Lance, Thea Queen, Sin, Rory (Ragman), and even Barry Allen (The Flash). In the present, Oliver and Dinah tolerated the presence of the camera crew to earn some good will. While out with the Star City PD, Oliver came across an injured Rene, who revealed that an unknown villain had kidnapped the new Green Arrow. Oliver turned to Diggle for help tracking down the new Green Arrow with ARGUS black ops satellites. But first, Oliver had to tell Diggle that the woman he was looking for was his own half-sister, Emiko. With Curtis’ help, they found a lair owned by Adam Hunt, which featured trophy masks from several vigilantes, including Ragman, the real Laurel, Huntress, and Emiko. Curtis dubbed the new villain Chimera, and marveled at the high tech armor that protected Hunt from harm. Chimera proved to be more than a match for Oliver and the SCPD, and he easily escaped when they tracked him down. A badly wounded Emiko warned Oliver that Chimera was coming for him. Emiko was hospitalized, but she quietly slipped away after receiving some medical treatment. Rene found Emiko at her headquarters, and they reaffirmed their partnership. Mayor Pollard attempted to discredit Oliver and the SCPD by hosting a town hall meeting. Oliver turned down the invitation, but Diggle convinced him to go through with it. Additionally, Diggle, Curtis, and Rene volunteered to resurrect Team Arrow and take down Chimera. True to form, Chimera attacked during the Town Hall. To save the mayor’s life, Dinah outed herself as a meta-human and joined the fight against Chimera. In the end, it took every member of Team Arrow to take down Chimera. Unfortunately, the team’s heroism was repaid by the cops arresting them. Oliver and Dinah confronted the mayor. He offered to turn himself in, while Dinah resigned from the police in protest. However, the mayor surprised both of them by rejecting their proposals. Instead, she told them to swear in Team Arrow as official members of the SCPD. Meanwhile, a visiting William felt emotionally estranged from his father and Felicity. He was also angry about being left in boarding school over Christmas. Privately, William almost came out to Zoe, before he and Felicity made amends. In the future, Blackstar watched the documentary, which had been banned for years. Blackstar’s real name was revealed as Mia. For any non comic readers out there, Mia Dearden was once Oliver Queen’s sidekick, Speedy. Her friend, Connor Hawke, is John Diggle’s son, who was last seen as an adult in DC’s Legends of Tomorrow. Together, they found the former headquarters of Team Arrow, while Mia openly dismissed the concept of vigilantes. More tellingly, Mia insisted that it was the vigilantes who created Star City’s dark future. 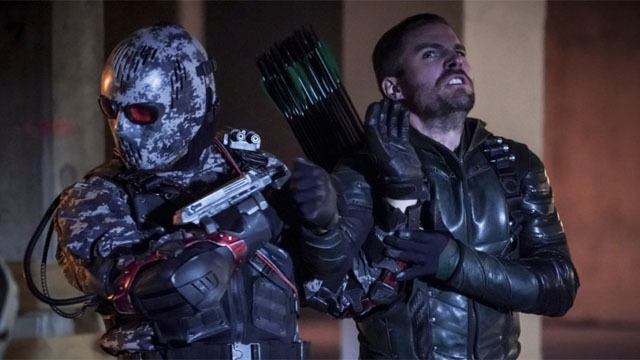 What did you think about Arrow season 7 episode 12? Let us know in the comment section below!